There are two ways to think about Rush. Subscribe to the idea that they have somehow ascended to become the proverbial Pabst Blue Ribbon of progressive rock, citing their position as third in total record sales after only the Rolling Stones and The Beatles. Or recognize them as the ultimate indie band, forming their own label (Moon Records) in 1973 before going on to become one of the most influential bands in history by never sounding like anyone else. I believe in the latter, enough so that I've held off writing about them even if they belong here. Once this Canadian trio shuffled up and settled on Alex Lifeson, Geddy Lee and Neil Peart as their permanent lineup, they have consistently crafted some of the most relevant, dynamic, and uniquely listenable experimental music over 44 years. Incredibility, they aren't done. They never disappoint. Clockwork Angels careens as a conceptual record, studio album number 20. Lost cities, pirates, carnivals, steampunk themes and other fantasies might sound like an odd ensemble for the concept thread. But the mercilessly mechanical and bass-laden watchmaker story, with its tight lyrics and abundance of instrumental standouts, soars brilliantly over this fantastical landscape. It's meant to be listened to as an album, unfettered, or the experience will be somewhat lessened. It was written to be an album; painstaking in its design. They didn't step inside of the studio and merely knock out 12 tracks. They started work on Clockwork Angels in 2009 with co-producer Nick Raskulinecz, who emerged much like the band did. The first record he produced was done on an 8-track recorder, well before he won a Grammy and worked with Rush on Snakes & Arrows. Sure, many songs like the massive 7:21 minute Headlong Flight can stand alone. From the opening chords, you know there is an epic element in the instrumentals. 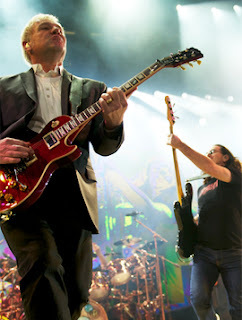 Lifeson and Lee originally composed Headlong Flight as an instrumental, but the song was later reassembled after Peart crafted lyrics that accurately capture the spirit of the song. It fits well within the concept, while sharing the sentiments of the band. Rush has had an entire lifetime of adventures as one of the few bands to successfully walk along the shore of the mainstream, watching everything that was happening and still always managing to do their own thing. Forever outsiders. "To what I felt back then, I wish that I could live it all again," Peart sings. Bright. Dark. It doesn't matter. It's all good. There's nothing to regret. Individualism carries its own courageous triumphs. There entire album is like that. After Caravan sets the tone of toiling away in the known world, Rush wastes no time at all questioning the commonplace. BU2B is the first flicker of dissent as the blue-infused riff and lyrics introduce an awareness that everyone plays their part, living in oblivious bliss. The story of Clockwork Angels is a journey with time, the one we all share. As the narrator travels his world, he shares feelings about the various places and people he sees, vignettes that sometimes encapsulate places like Chronos Square (the atmospheric Clockwork Angels), people he sees (the darkly evenhanded The Anarchist), or events such as the one when The Anarchist tosses him the device (and the determination along with it) to be different (the mystical trappings and climbing riff within Carnies). Carnies, both in its prose and arrangement, is one of the finest tracks on the album for its primal feel. Much like throughout the album, Lee has never sounded better here. As much as the band worked to tighten their play even more, Lee has stepped up to the most vocally challenging Rush album to date. Halo Effect is surprisingly light for Rush. Seven Cities of Gold is dynamically cinematic. The Wreckers is sad and harmonically stunning. And Wish The Well carries Peart's unique ability to write contemporary and poignant lyrics that play inside and outside the concept. No matter what happens or who wounds you, he surmises, just move on and wish them well. It's this astute piece of wisdom that gives measure to the album's conclusion. The Garden is as close to a ballad as it gets. But the passion being sung about isn't a muse as much as love for life and the resolution that comes with one well lived. Whatever's next. Let it come. In the immediate future, Clockwork Angels will be pushing the envelope further. Thinking big, Peart is collaborating with author Kevin J. Anderson to transform the album into a book. Anderson's a good choice. His first book, Resurrection Inc., was inspired by Grace Under Pressure. Clockwork Angels By Rush Ticks On 9.9 On The Liquid Hip Richter Scale. While the story isn't nearly as linear or overt as Hemispheres or 2112 (a century away this year), Clockwork Angels is a culmination of everything the trio has learned across their career and some surprisingly fresh material too. Long-time fans will no doubt hear the occasional nod to older works, but the bulk of this album is breathlessly original. It's as timeless as the band that made it. The full album comes with a digital booklet filled with stunning art. You can download Clockwork Angels by Rush from iTunes. The album can be found at Barnes & Noble (and the novel is already available for preorder). The Clockwork Angels [+digital booklet] is also on Amazon.